L-R: K.K. Glick and Grace Experience in GROUNDED by Chris Bohjalian, part of Summer Shorts 2018 at 59E59 Theaters. Photo by Carol Rosegg. 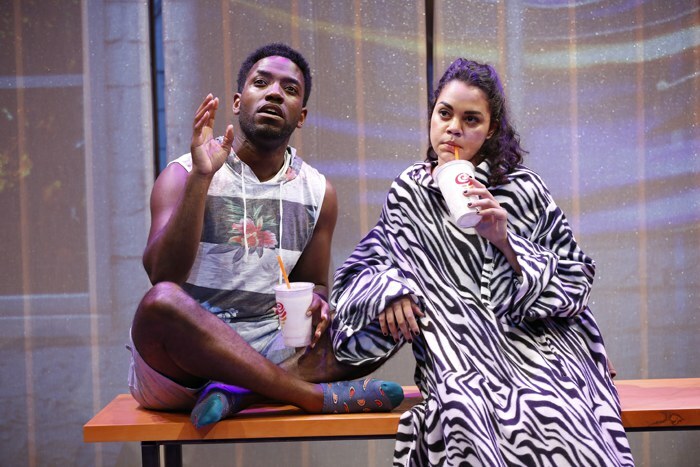 L-R: Deandre Sevon and Lindsey Broad in IBIS by Eric Lane, part of Summer Shorts 2018 at 59E59 Theaters. Photo by Carol Rosegg. L-R: Molly Groome and Jake Robinson in THE PLOT by Claire Zajdel, part of Summer Shorts 2018 at 59E59 Theaters. Photo by Carol Rosegg. L-R: Kate Buddeke and Joel Ruben Ganz in THE LIVING ROOM by Robert O’Hara, part of Summer Shorts 2018 at 59E59 Theaters. Photo by Carol Rosegg. L-R: Mariah Lee, Francesca and Stephen Guarino in KENNY’S TAVERN by Abby Rosebrock, part of Summer Shorts 2018 at 59E59 Theaters. Photo by Carol Rosegg. L-R: Kate Buddeke and Adam Langdon in THE LIVING ROOM by Robert O’Hara, part of Summer Shorts 2018 at 59E59 Theaters. Photo by Carol Rosegg. KeiLyn Durrel Jones in SPARRING PARTNER by Neil LaBute, part of Summer Shorts 2018 at 59E59 Theaters. Photo by Carol Rosegg. 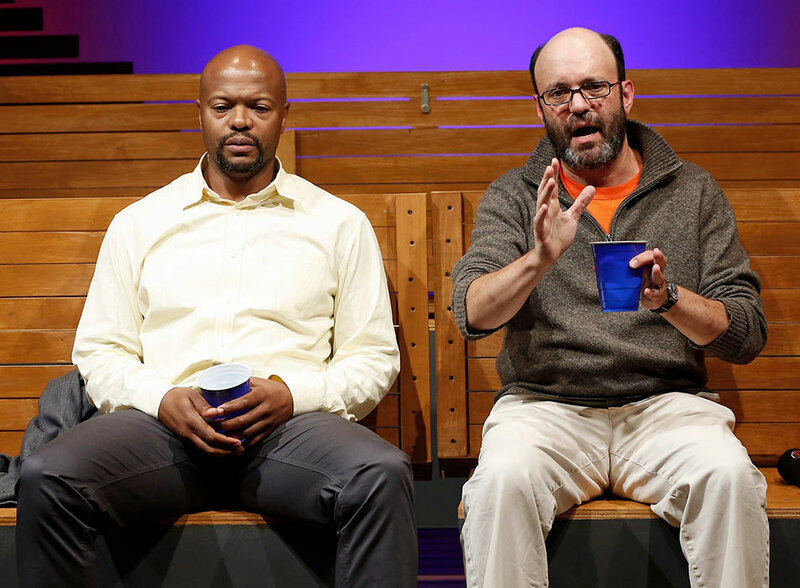 L-R: Harold Surratt and Deandre Sevon in IBIS by Eric Lane, part of Summer Shorts 2018 at 59E59 Theaters. Photo by Carol Rosegg. L-R: Mariah Lee, Francesca Fernandez McKenzie and Stephen Guarino in KENNY’S TAVERN by Abby Rosebrock, part of Summer Shorts 2018 at 59E59 Theaters. Photo by Carol Rosegg. Colby Minifie in LOVE LETTERS TO A DICTATOR by Stella Fawn Ragsdale, directed by Logan Vaughn, part of Summer Shorts 2015. Photo by Carol Rosegg. Clea Alsip and J.J. Kandel in 10K written and directed by Neil LaBute, part of Summer Shorts 2015 at 59E59 Theaters. Photo by Carol Rosegg. Carmen Zilles and Alfredo Narciso in UNSTUCK by Lucy Thurber, directed by Laura Savia, part of Summer Shorts 2015. Photo by Carol Rosegg. Meg Gibson, Kellie Overbey and Michelle Beck in THE SENTINELS by Matthew Lopez, directed by Stephen Brackett, part of Summer Shorts 2015 at 59E59 Theaters. Photo by Carol Rosegg. Justin Bernegger and Merritt Janson in BUILT written and directed by Robert O'Hara, part of Summer Shorts 2015. Photo by Carol Rosegg. Lauren Blumenfeld and Alfredo Narciso in UNSTUCK by Lucy Thurber, directed by Laura Savia, part of Summer Shorts 2015. Photo by Carol Rosegg. Meg Gibson and Michelle Beck in THE SENTINELS by Matthew Lopez, directed by Stephen Brackett, part of Summer Shorts 2015 at 59E59 Theaters. Photo by Carol Rosegg. Tanis Parenteau and W. Tre Davis in GLENBURN 12 WP by Vickie Ramirez, directed by Kel Haney, part of Summer Shorts 2015 at 59E59 Theaters. Photo by Carol Rosegg. KK Moggie and Alfredo Narciso in UNSTUCK by Lucy Thurber, directed by Laura Savia, part of Summer Shorts 2015. Photo by Carol Rosegg. Meg Gibson and Zuzanna Szadkowski in THE SENTINELS by Matthew Lopez, directed by Stephen Brackett, part of Summer Shorts 2015 at 59E59 Theaters. Photo by Carol Rosegg. J.J. Kandel and Clea Alsip in 10K written and directed by Neil LaBute, part of Summer Shorts 2015 at 59E59 Theaters. Photo by Carol Rosegg. Alex Breaux and Shane Patrick Kearns in THE SKY AND THE LIMIT. Photo by Carol Rosegg. Summer Shorts 2014. Victor Slezak and J.J. Kandel in THE MULBERRY BUSH. Photo by Carol Rosegg. Summer Shorts 2014. Dana Watkins and Brenda Currin in DOUBTLESS. Photo by Carol Rosegg. Summer Shorts 2014. Cezar Williams and Peter Jacobson in SEC. 310, ROW D, SEATS 5 AND 6. Photo by Carol Rosegg. Summer Shorts 2014. Henny Russell and Will Dagger in NAPOLEON IN EXILE. Photo by Carol Rosegg. Summer Shorts 2014. Adam Green and Miriam Silverman in RIVERBED. Photo by Carol Rosegg. Summer Shorts 2014. Cezar Williams and Geoffrey Cantor in SEC. 310, ROW D, SEATS 5 AND 6. Photo by Carol Rosegg. Summer Shorts 2014. David Beck and Andrew Glaszek (standing), and Dana Watkins on the ground in DOUBTLESS. Photo by Carol Rosegg. Summer Shorts 2014. Gia Crovatin and Elizabeth Masucci in GOOD LUCK (IN FARSI). Photo by Carol Rosegg. Summer Shorts 2013. Evan Shinners and Michael Countryman in BREAKING THE SPELL. Photo by Carol Rosegg. Summer Shorts 2013. Camille Saviola, Caroline Lagerfelt, Brian Reddy and Jim Murtaugh in PINE CONE MOMENT. Photo by Carol Rosegg. Summer Shorts 2013. Alex Manette, Michael D. Dempsey and Allison Daugherty in CHANGE. Photo by Carol Rosegg. Summer Shorts 2013. Kendra Mylnechuk and J.J. Kandel in FALLING SHORT. Photo by Carol Rosegg. Summer Shorts 2013. Stephanie Cannon, Mark Elliot Wilson, Marisa Viola and Ben Vigus in ABOUT A WOMAN NAMED SARAH. Photo by Carol Rosegg. Summer Shorts 2013. Michael Countryman, Crystal Finn, Evan Shinners and Jesse Scheinin in BREAKING THE SPELL. Photo by Carol Rosegg. Summer Shorts 2013. Kendra Mylnechuk, Shane Patrick Kearns and J.J. Kandel in FALLING SHORT. Photo by Carol Rosegg. Summer Shorts 2013. Peter Bartlett in CABIN PRESSURE. Photo by Rahav Segev. Summer Shorts 2012. Erin Darke, Connor Buckley, Megan Ketch, and Nick Gehlfuss in DRIVE-IN DREAMS. Photo by Rahav Segev. Summer Shorts 2012. Victor Slezak, Alicia Goranson and J.J. Kandel in THE FURIES. Photo by Rahav Segev. Summer Shorts 2012. 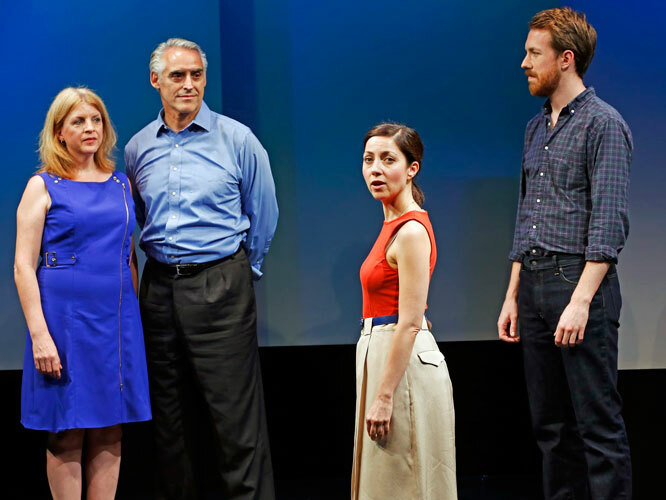 Sarah Corey, Edward Hibbert, Kevin Greene, Jessica Hershberg and Stephanie D'Abruzzo in LOVE AND REAL ESTATE. Photo by Rahav Segev. Summer Shorts 2012. Nancy Giles in ACCIDENTAL PUNDETTE. Photo by Rahav Segev. Summer Shorts 2012. Edward Hibbert and Kevin Greene in LOVE AND REAL ESTATE. Photo by Rahav Segev. Summer Shorts 2012. Arthur French & India Ennenga in SPIT. Photo by Rahav Segev. Summer Shorts 2012. Megan Ketch, Connor Buckley, Erin Darke, and Nick Gehlfuss in DRIVE-IN DREAMS. Photo by Rahav Segev. Summer Shorts 2012. Stephanie D'Abruzzo, Sarah Corey and Jessica Hershberg in LOVE AND REAL ESTATE. Photo by Rahav Segev. Summer Shorts 2012. Lydia Weintraub and Louise Sullivan in CARRIE & FRANCINE. Photo by Rahav Segev. Summer Shorts 2011. Christian Campbell, Neal Huff, Rebecca Schull and Jodie Markell in THE GREEN BOOK. Photo by Rahav Segev. Summer Shorts 2011. Nick Choksi in TRIPLE TROUBLE WITH LOVE. Photo by Rahav Segev. Summer Shorts 2011. Ted Koch and Erin Darke in IN THIS, OUR TIME... Photo by Rahav Segev. Summer Shorts 2011. Rebecca Schull and Christian Campbell in THE GREEN BOOK. Photo by Rahav Segev. Summer Shorts 2011. Shirley A. Rumierk and Socorro Santiago in LESSONS FOR AN UNACCUSTOMED BRIDE. Photo by Rahav Segev. Summer Shorts 2011. Victor Slezak, Meg Gibson, J.J. Kandel and Megan Ketch in CLAP YOUR HANDS. Photo by Rahav Segev. Summer Shorts 2011. Kathryn Grody, Crystal Finn and Arthur French in SOME WOMEN IN THEIR THIRTIES SIMPLY START TO FALL. Photo by Rahav Segev. Summer Shorts 2011. Jeff Binder, Mando Alvarado and James Chen in THE NEW TESTIMENT. Photo by Rahav Segev. Summer Shorts 2011. Ted Koch and Maryann Towne in IN THIS, OUR TIME... Photo by Rahav Segev. Summer Shorts 2011. Arthur French and Scott Adsit in HAPPY. Photo by Carol Rosegg. Summer Shorts 2010. Allison Daugherty and Josh Helman in PLAY WITH THE PENGUIN. Photo by Ari Mintz. Summer Shorts 2010. J.J. Kandel and P.J. Sosko in JONATHAN'S BLAZE. Photo by Carol Rosegg. Summer Shorts 2010. Jeff Binder and Demond Green in ROMANCE. Photo by Ari Mintz. Summer Shorts 2010. Allison Daugherty, Alex Manette and Josh Helman in PLAY WITH THE PENGUIN. Photo by Ari Mintz. Summer Shorts 2010. José Joaquin Perez and Kate Cullen Roberts in FIT. Photo by Carol Rosegg. Summer Shorts 2010. 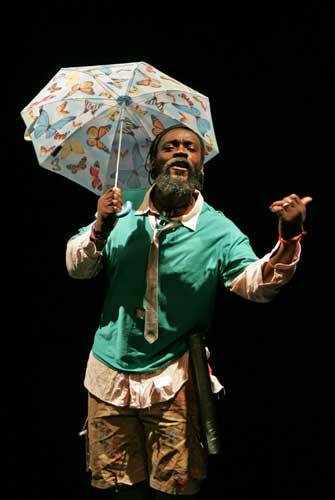 Iyaba Ibo Mandingo in THE EXPENSES OF RAIN. Photo by Ari Mintz. Summer Shorts 2010. Clara Hopkins Daniels in THE GRADUATION OF GRACE. Photo by Carol Rosegg. Summer Shorts 2010. 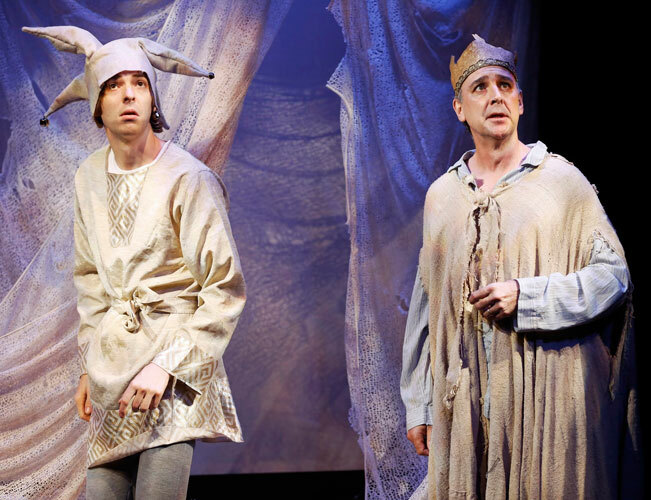 Mark Elliot Wilson and James Leighton in AN ACTOR PREPARES. Photo by Ari Mintz. Summer Shorts 2010. Victor Slezak and Margaret Colin in A SECOND OF PLEASURE. Photo by Carol Rosegg. Summer Shorts 2009. Neal Huff and J.J. Kandel in THE KILLING. Photo by Carol Rosegg. Summer Shorts 2009. Andy Powers, Shane McRae and Emily Tremaine in IF I HAD. Photo by Carol Rosegg. Summer Shorts 2009. Andy Grotelueschen and Stephanie D'Abruzzo in DON'T SAY ANOTHER WORD. Photo by Carol Rosegg. Summer Shorts 2009. Nancy Giles in THINGS MY AFRO TAUGHT ME. Photo by Carol Rosegg. Summer Shorts 2009. Leenya Rideout and Robert W. Dusold in THE ETERNAL ANNIVERSARY. Photo by Carol Rosegg. Summer Shorts 2009. Rosalyn Coleman, Clara Hopkins Daniels and Jamie Watkins in THE SIN EATER. Photo by Carol Rosegg. Summer Shorts 2009. Sherry Anderson and Mary Joy in DEATH BY CHOCOLATE. Photo by Carol Rosegg. Summer Shorts 2009. Amy Irving in THE WATERS OF MARCH. Photo by Carol Rosegg. Summer Shorts 2008. Anthony Carrigan and Lisa Birnbaum in ON ISLAND. Photo by Carol Rosegg. Summer Shorts 2008. Stephanie D'Abruzzo and Jonathan C. Kaplan in PLAISIR D'AMOUR. Photo by Carol Rosegg. Summer Shorts 2008. David Ross and J.J. Kandel in DEEP IN THE HOLE. Photo by Carol Rosegg. Summer Shorts 2008. David Beck and Mary Joy in ON A BENCH. Photo by Carol Rosegg. Summer Shorts 2008. Nick Westrate and Sherry Anderson in PEOPLESPEAK. Photo by Carol Rosegg. Summer Shorts 2008. Clara Hopkins Daniels and Janet Zarish in OUR TIME IS UP. Photo by Carol Rosegg. Summer Shorts 2008. Gio Perez and Mando Alvarado in CROSSING THE BORDER. Photo by Carol Rosegg. Summer Shorts 2008. Rozie Bacchi, Tony Campisi, and Derek Lucci in AMICI ASCOLTATE. Photo by Carol Rosegg. Summer Shorts 2007. Clara Hopkins Daniels and J.J. Kandel in MERWINS LANE. Photo by Carol Rosegg. Summer Shorts 2007. Ean Sheehy in THE P.A. Photo by Carol Rosegg. Summer Shorts 2007. Nicole LaLiberté and David Marcus in REAL WORLD EXPERIENCE. Photo by Carol Rosegg. Summer Shorts 2007. Colby Chambers and Catherine Curtain in FATHER'S DAY. Photo by Carol Rosegg. Summer Shorts 2007. Judith Roberts, Mark Elliot Wilson and Stephanie Cannon in RAIN, HEAVY AT TIMES. Photo by Carol Rosegg. Summer Shorts 2007. James Katharine Flynn and Grant Shaud in SKIN DEEP. Photo by Carol Rosegg. Summer Shorts 2007. Ann Talman and John Hickok in AFTERNOON TEA. Photo by Carol Rosegg. Summer Shorts 2007. John Sierros and Pilar Whitherspoon in WINDOWSHINE. Photo by Carol Rosegg. Summer Shorts 2007.